All who are baptized into Christ are welcome to the Holy Communion meal. We believe that Jesus is truly present in the giving and receiving of the bread and cup. Those who prefer to abstain or have not yet received first Holy Communion may come forward for a blessing; please cross your arms on your chest if this is the case. Please let one of the ushers know if you would like to receive Communion but cannot walk to the front of the church to receive it. The Minister and Communion assistant will bring Communion to you in your seat. First Communion Instruction– Each year Emmanuel Lutheran Church prepares a group of children to receive their first Holy Communion. Children who are in the second grade or above in Sunday School are entered into this program. 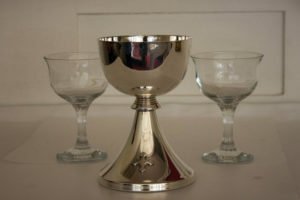 Classes are usually held during the season of Lent (spring of the year) in preparation for their First Holy Communion which is usually celebrated on the Sunday following Easter. For more information call the Church Office at 781-762-9457.